Second grade and I going over the Elements of Art. Here we are flexing our muscles and showing FORM. "Why, yes, I did become an art teacher so I could repeat myself over and over and OOOHHH-VERRRRR again. In fact, I'm pursuing my masters degree in the Fine Art of Repetition as I do love hearing myself give the same set of directions during one art class so stinkin' much!" If you are like me (and bless you if that truly is the case), you absolutely positively cannot stand it when you have just finished giving all sorts of fabulous directions only to have a student come up to you and say, "So, like, what am I supposed to do?" Well, roll-those-eyes, shake-that-head and face-palm it no more, my dear art teacherin' buds. I have a solution that has worked wonders for me: Call and Response! If you aren't afraid to be a little silly and animated (and, I mean, really. You teach ART, y'all! Get silly and animated already), then this method is for you. * Have a cue. The kids will need a signal to know when it is an appropriate time to repeat after you. I clear my throat with an "ah-hem" which they mimic and know that anything I say and do from then on, they are to parrot. * Deliver it in bite sizes. Keep your directions short and sweet so that the kids have an easy time repeating. * Make it silly. Silly sticks, y'all. They remember the silly. Goofy voices, funny phrases, that's the stuff they remember. * Add a hand jive. I'm all about the hand motions. Use those to help reinforce what you are saying. Throw some sign language in there to boot! Like I said, I do this with all of my students, kinder thru fourth. They are all expected to repeat (because I have noticed that those who do not never know what to do!). It truly works wonders! I've had parents tell me that they've tried it at home...sadly, it doesn't work as well there. And to change things up, I sat in front of a random supply cabinet this week. I thought y'all might want a look see without my crazy self sitting in front of it. So, what do you say? Is this something you would do? I really recommend you give it a go...your kids will love it and you'll be amazed at what they remember! We do this for all sorts of things: learning vocabulary, the elements of art and more. Have fun, y'all! We use "Booty in your chair-Not up in the air" when everyone is supposed to get settled and not be wandering or getting in someone else's space. The smaller kids love it and repeat it quite often. Dear Cassie, This video is the BEST. Made me laugh SO HARD! You are such a gift. Your faces are priceless and how you can always figure out a calm, clever way to not lose your mind outwardly is AMAZING. After 28 years of teaching, my patience is shot with the little ones and I am prepping myself by watching you hoping you will rub off! We start September 1st so I am gearing up big time. I have close to 800 kids K-5 in two schools, 36 different classes so YEAH, that's A LOT of darn repeating!!! I need all the help I can get. Please come visit NY sometime. I must meet you and thank you in person for all you do for us. Because you touch us, you touch all the kids we teach too! I'll be in NY for the conference this March! You might wanna try taping your lessons...no more repeating and they listen so well to the telly! I love your post but was also wondering about that first pic that you posted. Do you have motions for all the elements of art to help the students remember them? If so, would you be willing to share a little bit more about that and maybe what you do? I would love to know more, I always have a hard time with my students remembering the elements and principles. Thanks!!!! You know what, I'll share that in next week's 101! Thank you for asking!! Have so much fun at your new gig!! 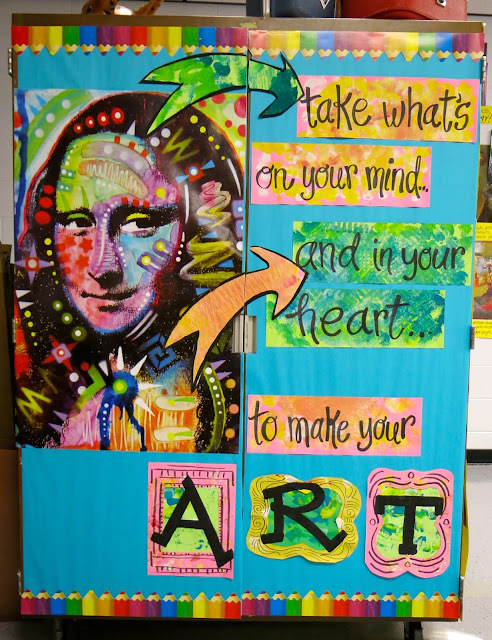 Did you make this mona lisa colorful poster? I want one! Love this! Great ideas. I would have to change the "store" to the appropriate cart drawer, but it could work fer sure, man! Like totally! I am so grateful for your inspiring videos and blogposts. I am making videos for my art classes and need some of your guidance on the best way to share them with my classroom teachers. YouTube is convenient, but the ads as well as videos and filth that can pop up after or on the sidebars are not appropriate for my Kindergarten audience. How do you publish your videos for your blog and your classroom? I use YouTube because it's easy. However, if you want to share with your buddies, you could simply "share" your video from iMovie (which is where I edit them) to your email and the email of friends. When I want to share a video with only friends, I share it to my desktop and from there, put it in googledrive and email to buddies. I post on youtube for all y'all to see it as it's the most convenient place. ClipGrab is a way that you can share your videos from YouTube without having naughty stuff pop up (because it "grabs" clips and puts them directly onto your desktop or where ever you like). Thank you so very much! I am grateful for your help!